Clock springs. Mainsprings. Power springs. Whatever you choose to call them, they are extremely versatile devices and ones that have a host of potential uses in a number of industries. What is a Clock Spring? 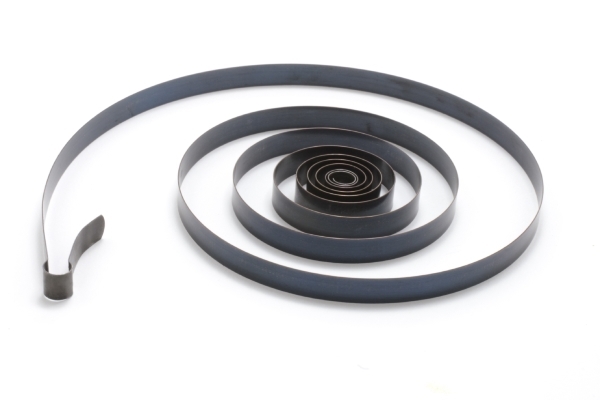 Clock springs (also known as power springs) consist of a flat, pre-stressed strip of metal or other spring material, which is wound tightly around an axle (known as an arbour) and into a securing ring. This ring (also known as the barrel) holds the pre-wound spring in place effectively producing a mechanical power source in a very compact space. They offer a circular movement and provide torque and are a useful alternative to the regular torsion spring, particularly where that circular motion is a required within a confined space. The inner end of the spring (arbor) is fixed over the shaft of the mechanism, with the outer end being attached to the barrel. The arbor is turned to wind up the spring. It releases energy when allowed to uncoil. Given its name, it likely comes as no surprise that the most common application for this kind of spring is in clock and watchmaking and repair. Certainly, this is the area most of us think of when we think of these springs. However, they are used in so many sectors. Any device that requires a smooth system of retraction, retrieving, and returning will likely utilise a clock spring. This could be anything from a retractable cable device in a theatre or cinema, to a retractable employee fob lanyard. Automatic reels, mechanical timers, wind-up toys and games, and all manner of counterbalances rely upon this spring to do their jobs properly. Likewise, given that another name for clock springs is power spring, should be an indicator of the sort of energy that can be held within one of these springs. On occasion, mechanisms need to be taken apart for repair or maintenance. If the necessary precautions are not taken, a power spring can come detached, releasing their pent-up energy in a single go, which can potentially cause serious injury. The appropriate solution is to wind down the spring and retained it firmly before releasing it from its device. As the country’s leading custom springs manufacturers, Airedale Springs can supply clock springs that are custom-built to your exact specifications. If you want more information, or wish to ask for a quote or order your clock springs, contact us today and a member of our professional, highly trained team will be happy to help.